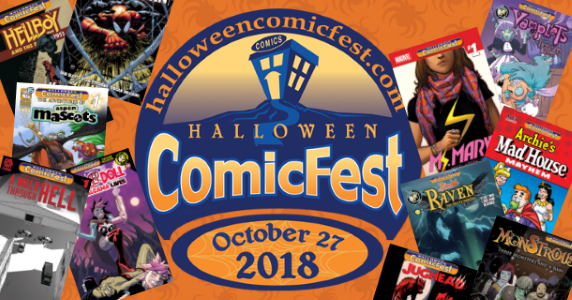 Halloween ComicFest 2018 Returns on Saturday October 27 - Horror News Network - The Horror News You Need! Other titles of note include: Jughead: The Hunger (Archie Comics), Garth Ennis and Goran Zudzuka’s new title A Walk Through Hell (AfterShock Comics), Frankenstein: Junji Ito Story Collection Sampler (Viz Media), Hellboy and the B.P.R.D. 1953: Phantom Hand and the Kelpie (Dark Horse), and Goosebumps: Monsters at Midnight (IDW) among others. 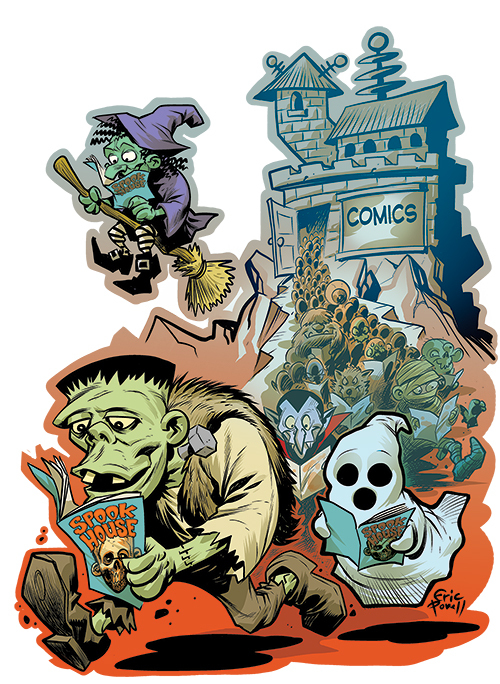 Goon artist extraordinaire, Eric Powell, provided the official artwork for the t-shirt for the event and he stated that “It was a pleasure to design this year’s Halloween ComicFest T-Shirt! Monsters, zombies, and vampires all live in the pages of comic books and that makes comics and comic book shops a critical part of the Halloween experience. I wanted my t-shirt design to reflect comic shops as both a staple of the community and a destination for spooky Halloween fun.” Eric Powell’s mini-version of his horror anthology Spook House will also be available at the event. Remember that not all of the titles may be available at your local store (although the major companies are always represented by participating stores, as a rule of thumb, the bigger stores usually carry a more diverse selection of titles). You may want to call ahead if there is a certain free comic that you are interested in. Find a participating store in your area at the official HCF website.